A seemingly novel time-travel mechanic shows depth in this engrossing 3DS enhanced port of a Nintendo DS RPG. With Chronology, Atlus has finally made good on the promise inherent in the original Historia. Then, the company threw in several hours of new material for good measure. The fact that Chronology's bonus additions divide out into one about story and one about combat reinforces the remake team's understanding of the game's underlying duality. The ultimate version of one of the most unique JRPGs in recent memory, finally edited in Europe. If language is not a barrier, and you like (or feel attracted to) the genre, then Radiant Historia: Perfect Chronology is a must have. A true gem. Radiant Historia: Perfect Chronology is a great package for people who never played the original and are looking for a great RPG but it doesn't offer enough good new content for people who played the original on the DS. 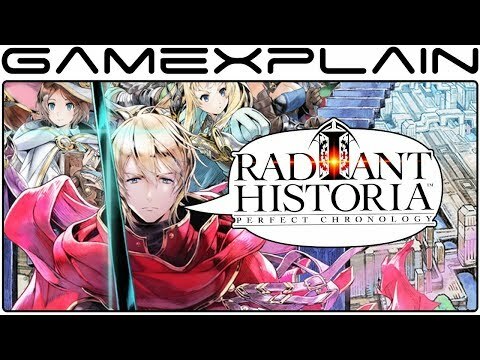 To those unfamiliar with this hidden gem, Perfect Chronology represents a new chapter in your very own White Chronicle where you can return to the past with all your new experiences and finally learn that Radiant Historia is one the best JRPGs you've never played. Radiant Historia': Perfect Chronology isn't as perfect as we expected, but is still an excellent opportunity to test a game which was never officialy released in Europe in a enhanced version. We would have enjoyed a more significant technical progress, and a french translation for this title who has a very developped story. These few minors flaws should not prevent the 3DS owners from playing a gold standard in japanese role-playing game. Radiant Historia: Perfect Chronology is a great porting, respectful of the original production. A game that any J-RPG lover should not miss for any reasons. _________________________ “Truly, the developers took inspiration from the finest, and somehow didn't just deliver a carbon copy of the originals, but something that transcends them in many ways. Highly acclaimed when it came out in early 2011, Radiant Historia Perfect Chronology is definitely one of a kind. Its full-narrative structure, the well-developped background, the intuitive combat system and the welcome additions of this 3DS version make it a game every JRPG fan should own. One of the greatest portable RPG is back. The bonuses and extras of Radiant Historia: Perfect Chronology are pretty good, making a must have to everyone that love this genre. Radiant Historia: Perfect Chronology is a fantastic JRPG. The expertly-crafted story comes together bit by bit as Stocke and Co. find answers hidden across time. Players will fall in love with the strong cast of heroes and they will come to fear the well-crafted villains. A classic-style JRPG with a twist, Radiant Historia: Perfect Chronology features an interesting time-travel mechanic as well as position-based combat that makes for some interesting strategy. The game is surprisingly linear despite its multiple paths and can get repetitive after a while. A novel concept combined with interesting characters, however, make Radiant Historia: Perfect Chronology worth sinking a lot of time into. The updates and alterations to Radiant Historia: Perfect Chronology are inconsistently worthwhile, but the game as a whole is as memorable and elegantly designed as ever. The additional timeline never really questions the naïveté with which Radiant Historia preaches of self-sacrifice. Radiant Historia: Perfect Chronology is more than fans could ask for in a remaster of an already great game. If in any case, you happened to have looked over Radiant Historia in the past or just kept it in your backlog all these years, it's time you give Radiant Historia: Perfect Chronology a try. Because ultimately, those who have not played Radiant Historia are in for an adventure with the best version of a timeless RPG. Radiant Historia: Perfect Chronology is a top-shelf JRPG, with an engaging time-travel hook, brilliantly fun, puzzle-like combat, and a genuinely likeable cast of characters. At the end of the day, whether you're taking a nostalgia trip back in time to revisit this classic or if you find yourself in Historia for the first time, it's definitely worth playing.